I had driven by many times. I had even seen the family in the fields harvesting. But I had never stopped in. And then she came for a visit - my crazy cousin, Pat, from Ohio. And so it was that I found myself at Smucker’s Gourd Farm on a cold, rainy, windy day in April. Pat is a painter of gourds – of all sizes and shapes. She makes cats, snowmen, Santa’s, you name it….they are beautiful works of art. Once inside this expansive shop, I knew from Patty’s comments that we had discovered a wonderful place. She quickly started picking out different gourds and making piles on the floor. Some gourds were big, some the size of a grape, some had long skinny tails, others were a little damaged. It didn’t matter; Patty looked at them all - at least once. Then we went outside to look at the “dirty” gourds – the ones just harvested by the family that hadn’t been scrubbed clean. Patty let out a low yelp. As I followed her gaze, I saw that off in the distance there was a field brimming with even more gourds. I was now thankful for the bad weather…because I knew that if it weren’t raining, we’d be heading down to that field. Patty clearly had a bad case of “gourd-o-mania”. 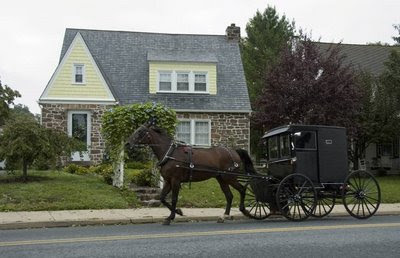 One of the Amish girls working the front desk asked if we needed any help. Since Pat was looking for a certain type of gourd (don’t ask me – these “gourders” have a language all their own), she offered to look for them in the barn. So we waited. Patty picked out more gourds while I admired the finished ones. Birdhouses, planters, and even a hat were painted for every occasion. I followed the sound of someone singing and discovered yet another teenager painting flowers on a gourd in a small room. We waited a little longer. Patty picked out still more gourds. After about 45 minutes, we politely asked if we could go to the barn. As we followed a five-year old to the ordinary looking barn, I remember thinking “what could be taking her so long?” But once inside, I felt as though I was in a movie as the place ballooned to the size of a football field. Stacked everywhere were four foot by four foot steel bins – filled to the brim with – you guessed it – gourds. Patty was in heaven. Even I was excited now. We arrived just as the 14-year old expertly backed the forklift through a tight spot to present a whole bin of the specific type of gourd that Pat wanted. We filled my car to the roof, made our way back to the inn and stored the gourds in the barn. When Pat’s husband came to visit a few days later, she went on another shopping spree. This time I asked John to take some pictures. Patty and John had a chance to meet the owner, Eli, and I don’t think it will be the last visit for Patty. The Pennsylvania Gourd Society holds its annual Gourd Fest at Smucker’s Farm, just down the street from our inn (The Artist’s Inn) on Route 897. It is scheduled for June 12 and 13 and features classes, supplies, children’s activities, a silent auction, and of course, gourds galore. If you are the least bit curious, this might be just the opportunity to discover if you, too, might be coming down with your own case of “gourd-o-mania”. The Bananas Foster Cheesecake Was A Big Hit Indeed! Easter was coming and I usually make a cheesecake. I’ve made all kinds – chocolate, lemon, New York style, my mother’s creamy recipe, with every kind of fruit…..but this year I was looking for something new and different. I love recipes and collect them from everywhere – the internet, newspapers, guests, magazines, friends…..I cut out the recipes and stuff them into my collection of cookbooks. I think I’m somewhat organized, but Bruce says that if I made a new recipe every day of the year for the next 20 years, I’d never run out. And so it was that I found this recipe –from a 1999 issue of Gourmet Magazine. 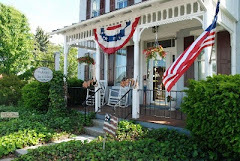 They give credit to Café Vermilionville….a quick look on Google reveals an historic inn in Louisiana. Their crawfish beignets sound wonderful. But back to the cheesecake. On Saturday afternoon, I start on the recipe. 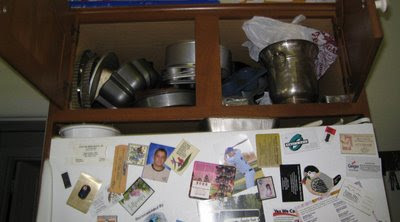 I am somewhat “storage challenged” at The Artist's Inn…and the specialty pans get pushed into the cabinet above the refrigerator. This means that there is no way (at 5’4”) I can reach them. Do I take the time to go get a chair from the dining room or a ladder from the basement? No. And there’s no tall husband around to retrieve the springform pan I see hiding in the far recess of the cabinet. I grab my handy wooden spoon and start poking. I manage to close my eyes just before I feel the first object come crashing down. The edge of a tart pan hits me between my eyebrows, followed quickly by the bundt pan and several mini-muffin pans. I know I’m in trouble and manage to reach into the freezer, grab an ice cube, and head for the bathroom. Watching the pink water run down the drain was not encouraging. The tart pan had left an inch-long gash. My only hope was that my eyes would not turn black and blue and that swelling would subside by the time I had to give a presentation on herbs the following Tuesday. Apparently, some families are quite amused at another’s expense. So was the case for the Garrabrandts. As family members arrived for the holiday, I heard several jokes – “Jan, I think the recipe called for a “dash”, not a “gash”, another suggested planting a sprig of rosemary on my forehead and yet a third (this was my husband) thought it would look good with a jewel covering the wound. My day was not complete until that evening, as we were coloring eggs, Bruce’s niece, Heather, accidentally bumped the cup of blue die and sent a tidal wave of blue water heading my way. Now I not only was sporting a gash between my eyebrows but also had blue die from my forehead to my waist. Did I mention that I was wearing a cream and aqua sweater? All’s well that ends well: The stains came out, my eyes never turned black and the swelling went down. Best of all the cheesecake was, indeed, a hit of the culinary kind. I hope that you have a less exciting adventure if you make it. I served the praline topping separately and found that it was just a bit much…..you may not need it at all. I also made a cream cheese crust – rather than the graham cracker one. As for that banana liqueur – I had it left over from some trip to the islands long ago, but the liquor store usually carries those cute little bottles by the check-out. If not, I think it’s a good excuse for a little trip to the Caribbean. You can also add to your rum collection while there. Enjoy! Preheat oven to 350 and butter a 10-inch springform pan. Wrap outside of entire pan with heavy-duty foil to waterproof. Make crust: Melt butter and cool slightly. In a food processor finely grind graham crackers with granulated sugar and blend in butter until combined well. Press crumb mixture evenly onto bottom of springform pan. Halve cookies crosswise and arrange upright, rounded edges on top, around side of pan, pressing lightly into crust to stabilize them. Make filling: In a shallow baking pan toast almonds in one layer in middle of oven until pale golden, about 5 minutes. In a 10 to 12-inch nonstick skillet melt butter with brown sugar over moderate heat, stirring until smooth. Stir in liqueur, rum, cinnamon, and vanilla and simmer mixture, whisking until sugar is dissolved, about 1 minute. Remove skillet from heat. Halve bananas crosswise and cut lengthwise into 1/4 –inch thick slices. Add bananas to butter mixture and cook over moderately low heat, turning them gently with a spatula, just until softened, 30 seconds to 1 minute. Sprinkle almonds over bananas. Make cream-cheese layer: In a bowl whisk together eggs until just combined. In a mdedium bowl with an electric mixer beat together cream cheese and granulated sugar until light and fluffy and slowly beat in half of eggs, scraping down side of bowl with a rubber spatula occasionally. Slowly beat in remaining eggs and stir in liqueur and vanilla. Pour half of cream-cheese mixture into crust and bake in middle of oven 10 minutes. Cool layer on a rack 5 minutes. Gently spoon filling evenly over layer, arranging bananas so they are not overlapping. Pour remaining cream-cheese mixture over filling and put springform pan in a large roasting pan. Add enough hot water to roasting pan to reach halfway up side of springform pan. Bake cheesecake in middle of oven until filling is set in center and top is golden and firm, 50 to 60 minutes. Cool cheesecake in springform pan on rack. Chill cheesecake, loosely covered, 1 day. Make praline topping: Preheat oven to 350. In a shallow baking pan toast pecans in one layer in middle of oven until a shade darker, about 5 minutes. In a 2 to 2 ½ quart heavy saucepan melt butter with brown sugar over moderate heat, stirring util smooth, and stir in water until incorporated. Stir in pecans and cool topping to room temperature. 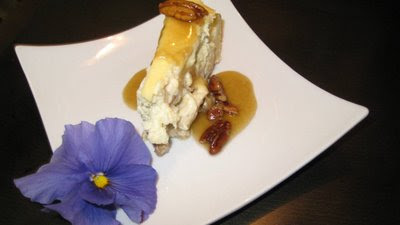 Serve cheesecake with praline topping. Serves 10 to 12. It was a dark and stormy night. Well, sort of. It was getting dark and storms were in the forecast. I was at the cottage and had just finished putting the new coverlet on the bed in the back room. I checked the bathroom to make sure there was enough soap and shampoo. It was then that I first heard it. It was a mournful cry….muffled and sort of distant….like something in distress or pain…something that needed help. Oh no, my mind raced, the poor thing – how long had it been crying? What was wrong? Could I help it? Where was it trapped? And….most importantly, what was it? Could it be a bird trapped in the gutter outside? – I opened the windows and looked, listened in the other rooms, went outside and looked up at the roof, ….no it seemed to be in the bathroom….odd. Having read too many Nancy Drew books in my childhood, I knew I had to investigate and find this “creature” before the guests checked in the next day. (It seems these things always happen when Bruce is out of town – he left early that morning for an art show in Maryland.) Being the (not so) brave innkeeper, I quickly sought the help of my friendly neighbors, Kathy and Bob. They are, after all, used to our antics as innkeepers – it’s part of the price of knowing the Garrabrandts - and sharing the adventures of running an inn and two houses. Surely they would know what to do. I found Kathy with Michael at the kitchen table going through the spelling list for school – equivalent and beverage were the hard words for the night. Kathy suggested that it might be a bird stuck in the attic. The attic – a look of horror must have come over my face because she quickly volunteered Bob to investigate. By law we must keep the door to the attic locked (no second means of egress from that floor). So the first order of business was to find the key. A call to Bruce bought forth the following: “it’s a small silver key next to the kitchen door”. We live in an old house – 160 years old. In that time lots of keys have collected on the key rack behind the kitchen door – in fact some would say there’s a convention taking place. Where these keys belong is anyone’s guess, but we are hesitant to throw any away because surely we will need that very key the next day, even if we never used it. It’s just the law of keys. So as I’m looking for the small silver key, there are no less than a dozen that would fit that description. Half of these fall off the little hooks and onto the floor, where the cats are quick to “help” me, as they become the latest soccer toy. With my keys in hand, I set off for the cottage – thinking that if none of these fit the lock, I won’t bother Kathy and Bob and the poor creature will have to wither away in the attic. Maybe it won’t smell too bad and when Bruce comes home he can smash the lock off the door. My mind was racing. Did I mention that it is now dark? Luckily, Bob and Kathy see the lights on at the cottage and are brave enough to both come over. Michael also shows up at the door, but Kathy tells him to go home, fearing that whatever is in the attic will come flying after the three of us…. And so we start up the stairs to the second floor. Step by step we climb higher…and enter the bathroom. All is quiet. And then it starts. Low and mournful, we all hear it and a silent look passes between us. What the heck is that noise? There is no choice but to try to get into the attic…and so we go to the back bedroom toward the lock…..luck is with us as the third key fits, the lock unsnaps and we slowly open the door and listen…….all is quiet…the creature is probably just up the steps waiting for someone. Kathy and I manage to step back in unison as Bob, (hey, he’s the guy), bravely reaches behind the door, turns on the light and starts the long walk up the attic steps…alone. Kathy and I look at each other – surely there will be a yelp or a scream any second as the creature comes flying around the corner. Visions from "The Birds" flood my mind from some dark recess. But all is quiet. We hear a few footsteps…..and then, when Kathy and I can’t stand it any longer, we tentatively yell out….Bob? A muffled voice from the back of the house says “there’s nothing up here, I can’t hear the noise”. Confused, the three of us now head back to the bathroom. Bob is listening to the wall, Kathy is inside the shower listening to the drain and she determines that it’s too rhythmic a sound to be an animal – perhaps it’s a child’s toy or some kind of alarm. I center on the area around the toilet. With one brave move I lift off the tank cover and there it is. We all stare in amazement. 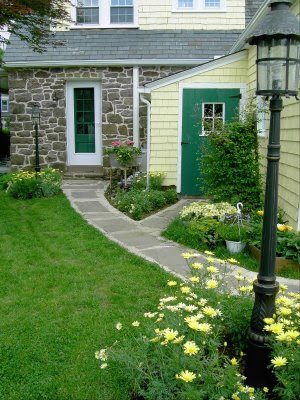 I will pause here to explain that almost everything in the cottage was replaced, removed or repaired when we remodeled. Everything, that is, except the toilet. Being an innkeeper I qualify as a semi-expert on toilets. (And having had eight old ones and one new one, that darn new one gave us so many problems that we tore it out and swapped it with an old one – there is no sight quite so terrifying for an innkeeper than a guest with a plunger in their hands morning after morning.) So no matter how much the plumber wanted to sell us a new toilet for the cottage, I held firm and kept this old one. The noise is coming from inside the tank. The three of us watch in amazement as a mixture of air and water move rhythmically back and forth in the tube connected to the round bowl connected to the flapper. And then Bob flushes the toilet. And so, the mystery of the noise at the cottage is solved and life in Terre Hill is once again peaceful.